"I like the fact that bronze can look like stone, mineral, wood, fabric or plastic," says Denver-based sculptor, Yoshitomo Saito. "It can become something else." And something else is what Saito does best, taking his cues from the stunning terrain of Colorado where he lives. "Bronze is like a language to me," he says. "After Japanese and English, there's bronze and I speak this language." His older works have included a seeming juxtaposition of works cast from copper; pillows, canvas and cardboard. However, his recent solo show at the Haines Gallery in San Francisco (his eighth solo show there) saw a plethora of unique work in bronze, from Rip Rap, a collection of varying sizes of rocks hung on a wall to his iterations of tumbleweeds, titled When the Wind Stopped, a form he's been toying with for years. "It's like making a nest," he says of his nature-inspired creation. "Technically, I'm welding the twigs together, but it's more like weaving." 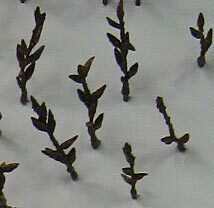 Perhaps his most striking piece at the Haines Gallery was Rocky Mountain Winter, a collection of 800 miniature trees ranging in size from one to 11 inches in height, mounted on a stark white wall. "I think that's one of the best pieces I've done," says Saito. Each piece is original, burned inside of an investment mold." His works are in the public collections of the M. H. de Young Museum in San Francisco, the Hawaii State Foundation of Cultures and Arts, and the Oakland Museum of California, among others. He's also enjoyed solo and group exhibitions in Germany, New Mexico, Colorado and extensively throughout California. He accepts private commissions and received one from the Haines Gallery show, where he works sell for between $3,000 and $60,000. 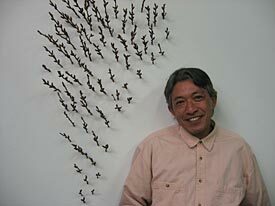 Originally born in Japan, Saito started out as a glassblower as an entrance into the arts movement in Japan. But, it was the unfettered practices of the American Glass Studio Movement that attracted him to this country. "I was quite taken with the attitude and freedom of expression and wanted to learn something from Americans," he recalls. He studied in the Bay Area and moved into bronze; having been trained in using the lost wax, or investment mold, process, something he still uses to this day. "It just happened to be that the foundry I worked at was set up for investment molds," says Saito. He's used the process for decades and prefers it to the more precise shell casting. Certainly many artists drop off their work at a foundry and are not involved directly in the process except to pick up the piece when perfectly cast. "But I have to wonder, what does perfect mean?" Saito asks. Ultimately it is the "imperfections" that can create unique art. "Flash is quite charming and can add characteristics and language to the expression of the form," he adds. There are other benefits to the lost wax method, too. "I like the fact that I can recycle the mold materials. It's economical and environmentally polite," he notes. Saito only uses three coloring elements in his castings. 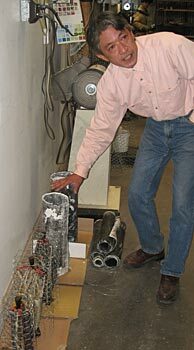 "I use ferric nitrate for brown, copper nitrate for green and potash for black," he says. "I change the sequence and combinations to get my colors." When he moved to Colorado recently, he set up his own foundry. "It's been my dream for 20 years," he says, adding that, although it is small in scale, it allows him to cast whenever he wants. Additionally, he was enthusiastic that he would be near his copper supplier, Atlas Metal Sales in Denver. Saito had been buying bronze ingots from them since 1975. "I thought, great, I can save on shipping costs. I used to buy bronze for just over $3,000 a ton." But, when he walked into Atlas the price increases caused him to "nearly faint." Now bronze is close to $9,000 per ton. "I don't know what's going to happen," he pondered in response to higher prices and more competitive buyers. In one sense, his Rocky Mountain Winter piece, "probably unconsciously came out of the current economic situation." It affords small pieces, but on a large scale, allowing a minimal use of supplies, though time consuming. However, ultimately cost is not a driving factor. "The priority of my life is to do something I really want to do." Says Saito. "I have no doubt that I compose interesting poetry with bronze. I never get bored or uninspired. I want to keep the positive spirit of copper alive."